Does your lower back ache at the end of every day, despite trips to the massage therapist or chiropractor? It’s a good possibility that your feet are the problem, not your back! That’s because the feet are at the base of your body’s “kinetic chain,” and how well they work and move impacts how everything above them works and moves too. If your feet aren’t doing their job correctly, aches and pains can show up elsewhere. The good news is that adjusting how you place and move your feet can improve how the rest of your body feels. Let’s talk about how the kinetic chain works, and what you can do for your feet right now to help relieve back pain. Every bone, joint, muscle and tendon in your body is designed to work alongside the parts next to it, like cogs in a machine. Your kinetic chain is the sum of all these moving parts: it begins with your feet, and runs up through your ankles, shins, knees, thighs, and hips into your lower back and up to your shoulders and neck. When one part of your kinetic chain isn’t functioning properly, like a faulty cog in a machine, it can throw everything out of whack, resulting in pain and injuries elsewhere. And, because your feet are at the base of this kinetic chain, even small, unnoticed foot issues can impact the rest of your body. Most people don’t think much about the arches of their feet. However, they are far more important than most people suspect: the tendons, muscles and ligaments in your arch are designed to act as a sort of suspension bridge, keeping your foot, knee, and hip in alignment as you walk. If the arch begins to weaken or “fall”—a common issue in a society where we rarely go barefoot, often walk on hard surfaces, and sit or stand in one spot for long periods—the foot rolls inward, or overpronates, with each step. Weak arches cause the knees to shift too far inward, leading the hips and pelvis to move unnaturally, which in turn stresses the lower back and spine and leads to back pain. Talk about a (kinetic) chain reaction! In cases like this, the only lasting way to reduce back pain is to restore arch support and fix your feet. So how can you keep your kinetic chain in top form? Start with improving foot strength and support. There are many easy, effective exercises you can do to strengthen the arch (we mention a few here in a previous blog post). 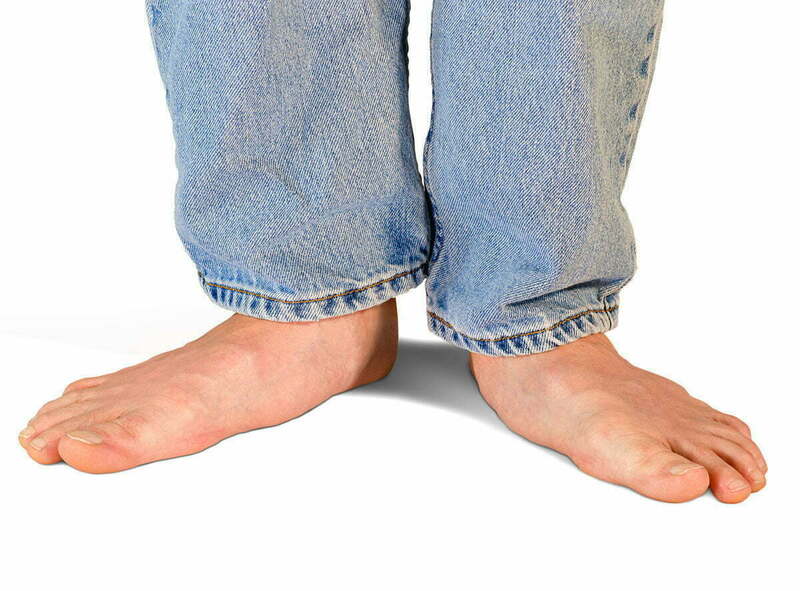 Barefoot walking can also help strengthen the feet; just make sure you are walking on a safe surface. Yoga is another great activity for addressing both foot and back pain, as using good “foot posture,” a.k.a. engaging your feet and toes while doing poses, is a huge part of yoga. Practicing yoga also helps you better tune into how your body is interconnected—and the stretches don’t hurt either! It’s also important to pay attention to your hips, glutes, and lower belly, or “pelvic girdle.” As the largest muscle group in your body, your pelvic girdle plays a significant role in stabilizing your kinetic chain, and weakness in the hip, gluteal or lower abdominal muscles can also lead to pain elsewhere in the kinetic chain. Improving foot support is the other part of the equation when it comes to reducing back pain. In addition to wearing supportive, properly fitting shoes, foot taping is a highly effective way to reinforce the “suspension” bridge of your arch, restore proper foot alignment, and quickly relieve pain throughout your kinetic chain. QUICK TAPE® foot support straps are designed specifically to provide optimal arch support. Each QUICK TAPE® support strap wraps around the midfoot and arch and extends around the base of your heel, helping to lift the arch and keep the heel and foot moving together. As you move, your foot moves as it is supposed to, correcting issues such as overpronation, helping your foot, ankle, knee, and pelvis move in proper alignment, and taking pressure off your lower back and spine. Made from a single piece of professional-grade athletic tape, QUICK TAPE® support straps are comfortable, easy to apply, and it does not stretch—a key advantage over drugstore tapes, because that means you get the arch support you need no matter what you are doing. By improving your kinetic chain from the bottom up, foot taping with QUICK TAPE® support straps can help with more than just foot pain and lower back pain—wearing our foot support straps can significantly reduce pain in the knees, shins and hips too! Contact us to learn more, or better yet, try QUICK TAPE® support straps now by ordering directly from us! We can’t wait to help you experience life without pain getting in the way.